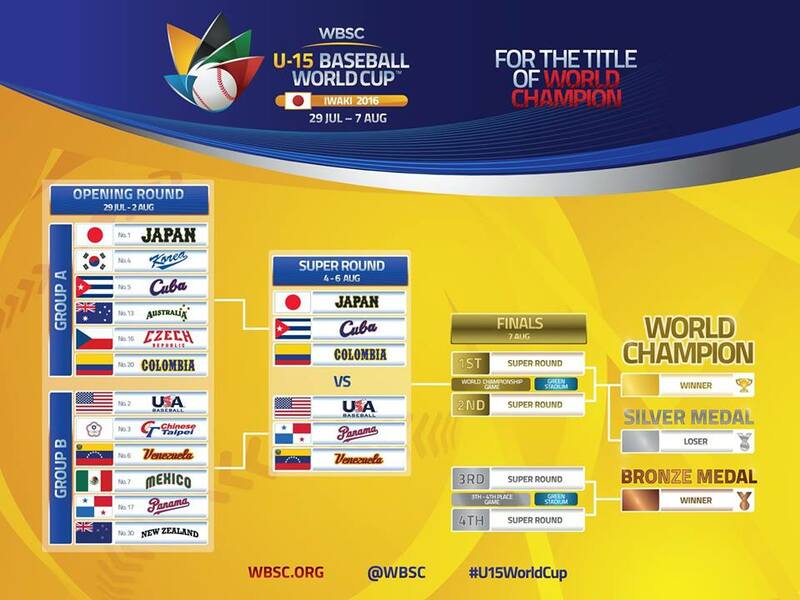 Cuba thrashed Czech Republic today to secure their place in the super round of the World Baseball Softball Confederation (WBSC) Under-15 Baseball World Cup in Iwaki. An emphatic 11-1 victory saw the Cubans finish second in Group A behind runaway winners Japan, who made it five wins out of five with a 10-6 win over Colombia. South Korea’s chances of reaching the next phase were shattered after suffering a 4-3 defeat against the previously winless Australia. Venezuela progressed from Group B along with today’s opponents Panama, despite falling to a narrow 7-6 loss. Both countries picked up three wins from five outings overall but neither were a match for table toppers the United States, who thumped Mexico 16-0 to complete a perfect opening round. Chinese Taipei overcame New Zealand 10-4 to record their second win, however, it was not enough to claim one of the coveted three qualification spots. Following a rest day tomorrow, the super round is due to start on Thursday (August 4) and last until Saturday (August 6) and will see the six countries still in contention compete in a round-robin format. Results from the opening round will be carried over with the three Group A teams set to face the three Group B teams and vice versa. That means that Japan and the US are the frontrunners from the outset with two wins apiece. The six eliminated teams will compete in the round-robin consolation round to determine the final placings from seventh down to 12th. The same format as the super round will be used.